This is a Cantonese dim sum. 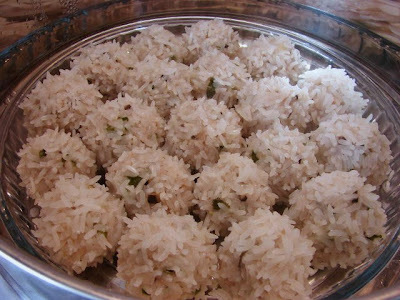 The glutinous rice looks like little pearls studded all over super scrumptious meatballs. 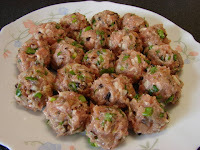 You can find these in many dim sum restaurants, they are dead easy to make at home. Recipe will feed 2 very hungry people to 4 light eaters. Soak the rice for 3 - 4 hours. Then drain thoroughly for use. Mix B together and leave in the fridge for 1 - 2 hours. After that mix in C.
Divide the meat mixture into 18 - 20 portions and roll into meatballs. 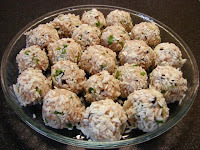 Put meatballs on a shallow dish or a paper lined bamboo steamer and steam for about 20 - 25 minutes or till the rice is cooked (translucent) and fluffed up like spiky pearls. Eat immediately while hot on its own or dip in any of your favourite sauce, soy, chilli etc...... Any left over can be re-steamed, don't microwave or the rice will be chewy. I have a question about its Cantonese origin, following my interest in understanding the different regional cuisines. I have seen it also called Hunanese (see Fushia Dunlop's book, page89). Is this a case of a dish prepared in different regions, each thinking it originated it? A little like Hot Sour Soup whose Sichuan origins (I think!) are sometimes ignored; in Paris where I live, it is called Pekinese soup even in a proper Sichuan restaurant! Thanks for your help on this small matter. After all it's the taste, texture, look, etc. that count. Far as I know it's Cantonese, could be popular in other area of China too. I don't think the origin is important as long as it's tasty. Sorry don't have Fushia Dunlop book and never use any of her recipes before. Great vidio. Meat balls look good.